tubemen88 has no other items for sale. This wireless broadband router from Actiontec has been updated from previous versions to include gigabit Ethernet to support very high-speed Internet service. The Actiontec MI424WR offers 300 Mbps with 4 ports, plus various other features and performance capabilities that make it stand out. This wireless broadband router breaks previous industry performance benchmarks and can increase your in-home networking speeds up to 1,000 Mbps wired with the Gigabit Ethernet interface, while it reaches 300 Mbps wireless. It is a great tool for streaming media-intensive contents, including videos and games, and it also has a filtering control system and firewall to protect your network from intruders. Arrived on time and in very good condition with all of the promised components. Works great replacing the FIOS G1100 router at $11/month. Payback in 3 months! Doesn't have 5G wi-fi like the G1100 but that speed didn't work more than 20 feet from the G1100 router so ended up using 2.4G most of the time anyway. Same 2.4G speed as this MI424WR. Wired speeds same as newer G1100 router. This router works fine with lan but works very slow with wifi.. my apt is 1300 sqft .. i see the speed of Wi-Fi is less in my other rooms..
Rev. I is the current model that Frontier ships with their FiOS service and provides configuration for WPA-2 wireless security. 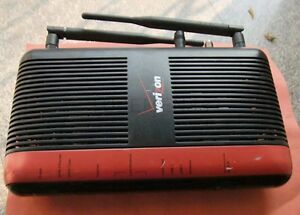 I found that it boots & accesses the Internet noticeably faster than the earlier Westell 9100EN, but draws about 3x the power. (I also experienced two heat-related failures with the Westell units that drew less power.) The Actiontec does use an internal passive heat sink, but one chip runs at 133 degF surface temperature. Therefore I added a cooling fan that reduced the chip temp to 86 degF. In lieu of a fan, I would recommend using the case slots to vertically mount the router to the side of the desk or hutch with unobstructed air flow on the top and bottom to maximize convection cooling. Great, inexpensive way to extend your network. Plug in to a spare cable outlet and easy to configure as a MoCA router and have your network available in the basement. Down side is only one SSID.